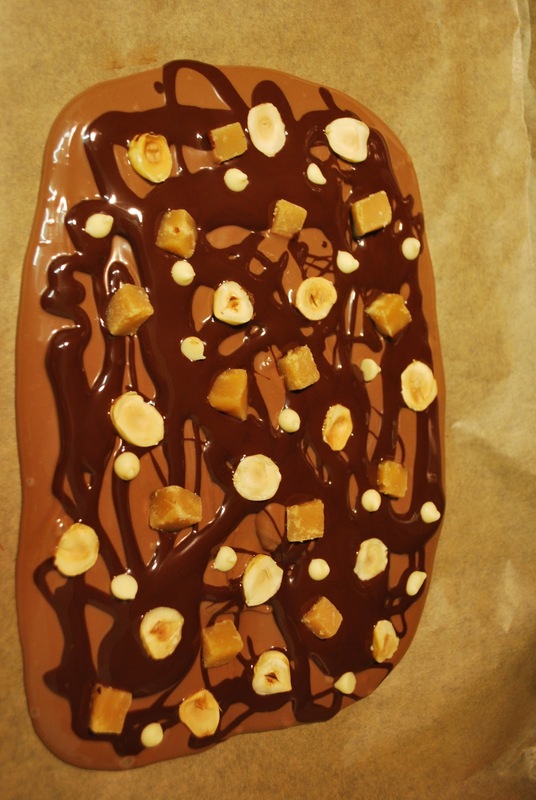 Sarah's Kitchen Diary...: Daring Bakers August Challenge! I've been taking part in Daring Bakers for a few months now but until now as a non-blogging member. For anyone who hasn't heard of it basically on the 1st of every month a recipe is posted. We all bake the same recipe and then post the results on the 27th of each month. This month the challenge was to make two chocolates/sweets including trying tempering chocolate. I decided to make chocolate truffles and chocolate bark. Half of the truffles I dusted in cocoa and the other half I dipped in tempered milk chocolate and drizzled with tempered dark chocolate. For the bark I swirled tempered dark chocolate into milk chocolate and decorated with roasted hazelnuts, squares of fudge and white chocolate chips. Yumm, your barks sound so uber-chocolatey and decadent. Wonderful job!